Sometimes successful cup runs are built on such moments. With the last touch of the game and with a rampant Hucknall seeking an equaliser and extra time having clawed back two goals in the last fifteen minutes, Khalsa keeper Sam Arnold somehow flung himself across his goal line and saved a close range shot by Joe Ashurst second after the ball had bounced off the crossbar. It meant Khalsa clung on and are through the third round of the Vase, having at 3-0 been cruising. 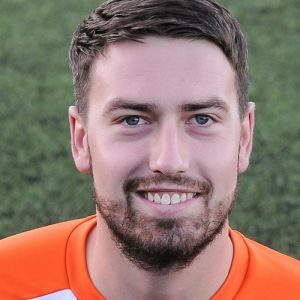 Earlier, Dan Westwood putting on a finishing clinic to grab a hat-trick, his second of the season and taking his total in the FA Vase to six. Hucknall – unbeaten this season and with 40 goals in their seven league games – were put on the back foot early doors. First Adam Jablonski in the Hucknall goal had to save well to deny Lee Chilton within two minutes and then almost immediately afterwards Westwood opened the scoring, firing home from the edge of the area. Jablonski then produced a great save, getting a vital finger to push Chilton’s shot onto the post on 19 minutes as Hucknall struggled with the early tempo. They gradually got a foothold and almost equalised, Dave Meese having to clear a goal-bound effort from Shane Newton after Arnold had rushed out of his goal in pursuit of a through-ball. Goals either side of the break did the damage. With about a minute before the interval, Rico Taylor set Westwood free and he rolled simply into the net. And then about a minute after the restart, Westwood wrapped up his hat-trick, latching onto a weak backpass to finish in style. The game petered out a bit for the first phase of the second half, Hucknall continuing to press but held off by Khalsa’s defensive ranks. The first warning signs of the Hucknall comeback came on 63 minutes, Ashurst having a decent opportunity but skying it and five minutes later Arnold had to save smartly to deny Matthew Brian from a corner. Two minutes later Jamie Crawford got through on the break, shooting wide. At the other end, on 72 minutes Jablonski produced a great save with his feet to deny substitute Mensah Kinch as he broke through and three minutes later at the other end Arnold was in action to deny substitute Adam Nelson. On 83 minutes Hucknall got their breakthrough, Nelson tucking away on the break after excellent work by Crawford to give the visitors a sniff of an opportunity. The sniff turned into a full on cold 89 minutes, Nelson again taking advantage of some slack defending to score from a Cayne Maxwell pass. Naturally, Hucknall threw the kitchen sink at it, allowing Khalsa to break and Jablonski producing another good save from Kinch. Then, in the final moments, a shot from Nelson on the right crashed against the crossbar, falling to Ashurst who looked certain to score before Arnold’s brilliant save. Sporting Khalsa: Sam Arnold, Carlo Franco (Vidal Hendrickson), Luke Adams, Shawn Boothe, Tes Robinson (captain), Alex Perry, Rico Taylor, Dave Meese, Dan Westwood (Jay Holdcroft), Josh Thomas (Mensah Kinch), Lee Chilton. Subs not used: Alex Woodhouse, Liam Armstrong.